An evergreen member of the mint family it has a sweet, powerful and long lasting scent that has often been used in perfumes, pot-pourri and herb pillows. Butterflies and bees love the white, pink, blue or purple flowers that Hyssop grows. It was often planted in medieval monastery gardens in the 17th century and was often featured as an ornamental flower in English gardens. 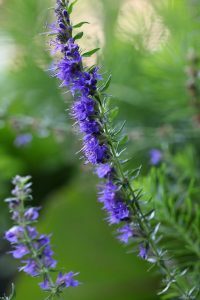 To the Hebrews, Hyssop was a sacred plant used for cleaning the holy places. Romans valued it to protect them against sickness including the plague. It was said that it was used in the Water of Purification that God commanded Moses to prepare. The Greeks valued Hyssop in the same way. Dioscorides referred to it as the ‘holy herb’ since it was an ingredient of incense used in cleansing ceremonies. The essential oil contains the ketone pino-camphone which in high doses can cause convulsions. The recommended doses should never be exceeded.